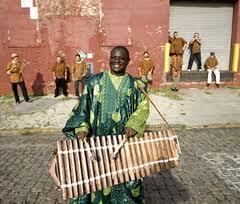 Famoro Dioubate is a master of the balafon from Guniea, West Africa. He performs live on the radio with Yacouba Cissoko on kora, Raul Rothblatt on cello and Sean Dixon on drums. We also hear him with his full ensemble Kakande. Famoro is djele, or griot, and his family have been an unbroken chain of musician/historians for almost 800 years.